Category: Horse Gear: Prices include shipping to lower 48 United States. (Most gear is hand made by the Graef family.). Brent explains, “The flag means, try harder to follow my feel. Follow the feel on the lead rope, and the feel of my intent. We don’t want to ‘de-sensitize’ him. The opposite of sensitive is dull. I don’t want him dull. I want him accepting of whatever I bring to the table, and to look for the meaning in it.” Watch Brent work with several horses. Some are afraid of the flag; some have learned to ignore the flag. Also includes instruction on getting a horse to pick you up off the fence or mounting block. There is a difference between a horse who is looking to move away from pressure, versus a horse who is coming into a place of peace. Some people think the way to offer peace is to create commotion, and then let it be quiet. That’s one way….. but, if you can find ways to have your horse hunt for peace without always creating commotion, wouldn’t that bet better? 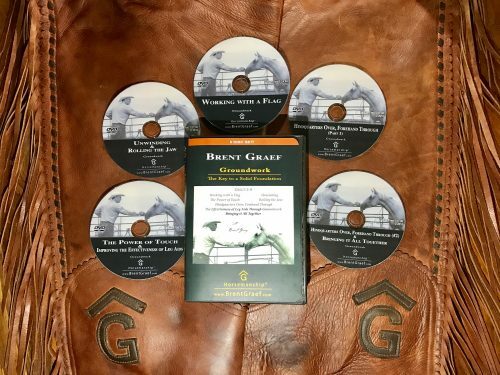 In this DVD, Brent offers a few ways to do just that… how to offer a “feel” your horse will hunt for without creating commotion…. how to offer the feeling of ‘draw’ instead of a offering an uncomfortable ‘pull’ on the lead rope or reins. Needless to say, the horse will have a better expression if he’s coming toward a good feel, instead of escaping something uncomfortable. Petting is an important piece of the relationship/communication with your horse that feeds directly into the quality of your ride. You can get a horse dull by how you pet them, and when you quit. You can also cause a horse to be pushy. Then, they’ll push through your reins, your legs, and push against your thoughts. The quality of your touch, the timing of when you reach for them, and when you back away, are all factors. Also, Brent offers tips on early touches of previously untouched yearlings. Sometimes the way a person uses their legs (in the saddle) creates a lot of confusion for the horse and we end up teaching him to tune us out. By doing this exercise on the ground, you’ll become aware of how you’re using your legs, and how the horse perceives your aids. You’ll see Brent work through several different situations. Some of the horses needed to become more responsive, and some were nervous and running away from leg aids. You’ll learn how to help your horse be able to be as responsive as you want him to be, but still be relaxed. You’ll learn to see if your horse is moving balanced and finding the most efficient way to put slack in the rope. Does he bring the hind first; then the front. Sometimes they’ll bring the hind all the way around, or just the front all the way around. You’ll find parts that are sticky. When unwinding, the horse will change eyes on you. You’ll learn why this has an emotional affect on the horse, and how it helps develop straightness. This exercise does a good job of establishing a connection from your mind and reins, to the horse’s mind, and down to his feet. It’s also an opportunity to let the horse know you’ll give him time to think. We’re not just pulling them through, we’re giving him time to find the answer on his own. If he knows you give value to his ideas, he’ll be more likely to turn his thoughts over to you. Also, he’ll learn that when you offer direction, it is with his best interest in mind. The motion of rolling the jaw has an affect on the horse’s entire body. Some call it “Head twirling“. It’s also part of what some call “Jaw Flexions“. You’ll learn how the degree of mobility in the Atlanto occipital joint (a.k.a. poll) is directly related to the degree of mobility in the hindquarters. Learn how to recognize and release blockages in that joint. Learn why it’s important to lengthen (not shorten) the horse’s neck when asking for a ‘soft feel’. Then, you’ll get a lesson in lateral flexion from the ground, and from the saddle. There are a lot of pieces to quality in lateral flexion. It’s not just bending the neck around. Essential in teaching your horse to lead accurately, this exercise is a great way to help your horse learn to balance himself and use himself properly. To do this exercise properly, he’ll have to become balanced evenly over all 4 feet and learn to maintain his balance when changing between his hind/front, right and left. Also, you’ll get a sneak peek into a young colt’s first tying lesson. All of the exercises you’ve learned throughout this DVD series will come together as you watch Brent with “Dally”. You’ll see how he finds the holes in her foundation, and works to fill in those holes. Good horsemanship is not a cookie-cutter program. The right thing for one horse might be exactly the wrong thing for another. Brent wants you to learn to read the horse and to think for yourself.